The Nikon Coolpix CP4500 is a good ‘point & shoot’ camera to pair up with a Spotting Scope and can achieve surprisingly good results. There are several options available to mount the CP4500 to the eyepiece of the scope. I use the Swarovski DCB-A bracket which fits to the body of the scope. Once you have set up the position of the camera in relation to the eyepiece, the camera can be swivelled away from the scope eyepiece enabling normal viewing through the eyepiece. If an opportunity arises to photograph a bird, you simply drop the camera into place using the DCB-A bracket. To achieve the best results with this set up a solid tripod or clamped monopod is the best option. With higher magnification it is essential to keep the camera/scope absolutely still otherwise the camera shake will make the resulting pictures unusable. I also recommend a cable release to press the shutter. Several commercial adaptors are available to allow a cable release to be used with the CP4500. Always use the camera in full manual mode. ISO is usually set to 200. Shooting at 100 ISO in anything other than full sunlight will not be possible as the resulting shutter speed will be to slow to capture anything but the most compliant bird! 400 ISO will produce too much noise in the image. Set the focus mode to ‘Macro’-the flower symbol. Set metering to ‘Spot AF Area’. Make sure you capture JPEG images set to ‘fine’ & go for the highest image size available(2272 X 1704). You can use TIFF for a much higher quality image but the camera takes an age to save the image so not really practical for bird photography. DIGISCOPE WITH NIKON COOLPIX OR DSLR CAMERA USING TLS800 ADAPTOR? Deciding which will be the best set up for you depends largely on what you hope to achieve. With the Coolpix you can use the scope to spot with & bring the camera down only when you need it. You can use the 30ww or 20/60 eyepieces with the Coolpix at 1-4x zoom giving huge amounts of magnification which could be useful for capturing a distant bird for later identification. In good light & with tripod/cable release set up you may even get the odd ‘keeper’. One of the biggest limitations with the coolpix is slow shutter release making a it difficult to capture a shot before the bird has moved. This can be achieved easily with the TLS800 set up & a DSLR camera body. It is also much harder to ‘find’ a bird using the liveview screen on the back of the coolpix. This limitation makes it virtually impossible to take flight shots using the coolpix. Flight shots can be achieved with the DSLR/TLS800 combination with practice but you do have to get used to manually focusing the scope while tracking the bird in the viewer. This is much easier looking through the DSLR viewer than using a liveview screen but a solid tripod or monopod is essential. A monopod is especially good for stalking a subject. The TLS800 is a bayonet type fitting so you can quickly change it for an eyepiece should you wish to use the scope for spotting rather than photography. I find that most of my digiscoping is achieved with the TLS800/DSLR set-up but I keep the coolpix in my kitbag for the odd opportunity to photograph something that is too far away for the DSLR to capture effectively. Of course, once you have your pictures you are limited to a 1.5 mb file shot on a 4 megapixel sensor with the Coolpix. In contrast, the DSLR will be able to capture RAW files of 12 mbs & higher allowing for more flexibility in post-production & exposure correction. 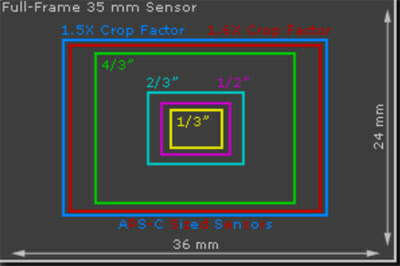 The yellow outline is the typical size of the sensor found in a point and shoot camera, compare this in size to the white outline illustrating the size of a ‘full frame’ camera chip. In practical terms this means that on any sensor the larger the number of pixels the smaller each individual pixel will become. As pixels reduce in size their ability to accurately record light information reduces and ‘noise’ levels significantly increase in the resultant images. In a point and shoot camera with a small sensor a 4 - 6 megapixel resolution is more than enough, as the pixel count increases so the will the noise level. To get high quality with 12 megapixel cameras you will need a APSC type or full frame sensor in a DSLR camera. To obtain the level of detail viewed in the example Nuthatch image the bird must ‘fill the frame’, cropping images will always significantly reduce image quality.